In front of the “Archways” Mural lies another piece of art, Trestle Inc.’s commemorative Brick Walkway. Engraved in bricks are the names of loved ones memorialized and/or honored by family members, friends, spouses and significant others. In addition, nicknames, dates or symbols are also recorded in the bricks to represent further a sacred life. Orders are received from August until August of the following year, with an annual unveiling in October. 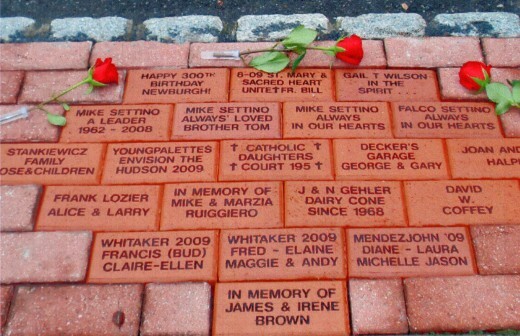 At the annual Brick Walkway Unveiling Event, hundreds of family members and friends gather for a reception with light refreshments, a brief program, and to find their special, newly engraved bricks. The emotions run high as the red carpet is lifted and their bricks are unveiled. Click here to view our 2013 bricklaying speech. The Commemorative Brick Walkway was started to maintain the “Archways” Mural. Donations are collected to pay for the engraved bricks and for bi-annual paint restorations: the cost of paint, clear coat, supplies, machinery lift and artists’ wages. This reliving walkway, aesthetically laid, silently tells the story of each one’s life. Click here to download the brick form. 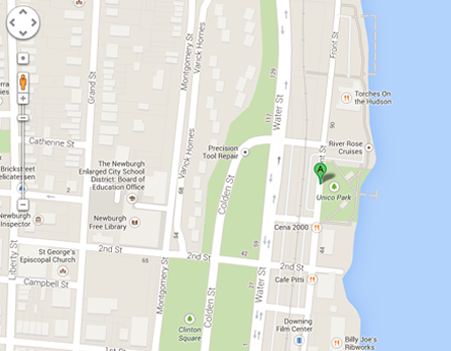 The Brick Walkway is in Newburgh, NY on Front Street between 2nd and 4th. Trestle Inc.’s “Commemorative Brick Walkway” lines the sidewalk on the mural side of Front Street. This memorial brick walkway lies between the parking lot by “Archways” and the sidewalk, with grassy patches and trees overshadowing. Its length comprises the entire stretch in front of “Archways,” with the Heroes section at the far end, closer to the parking lot entrance by Third Street. The “Commemorative Brick Walkway” has ample parking space. After turning on Fourth Street, take a right on Front Street and follow the sidewalk to the first parking lot entrance which will take you right to the mural. Park your car in the “Archways” parking lot and head towards the sidewalk. Then walk up and down the sidewalk to read the names of loved ones engraved on the bricks.